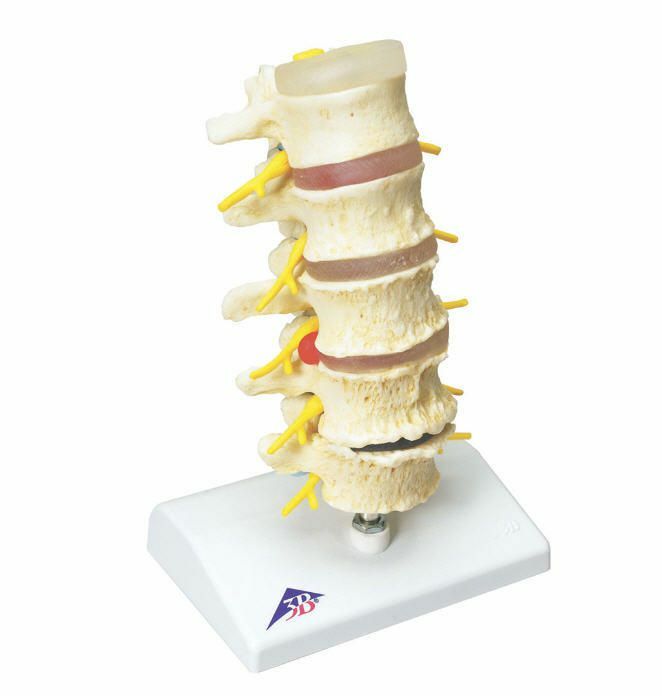 The model illustrates degenerative changes to the vertebral bodies and intervertebral discs of the lumbar spine in various degrees. Based on the original cast of a human lumbar spine, even finest bone structures are accurately depicted. The following conditions are shown from top to bottom: Intervertebral disc in healthy condition, Lumbar vertebra (L1) without degenerative changes, Intervertebral disc with protrusion, Lumbar vertebra (L2) with beginning degenerative changes, Intervertebral disc with medial prolapse, Lumbar vertebra (L3) with advanced degenerative changes, Intervertebral disc with intraforaminal prolapse on the right, Lumbar vertebra (L4) with strong degenerative changes and bony constriction of the left intervertebral foramen, Extremely narrowed intervertebral disc, Lumbar vertebra (L5) with strong degenerative changes and bony constriction of the left intervertebral foramen with pressure on the spinal nerve root L5 on the left. 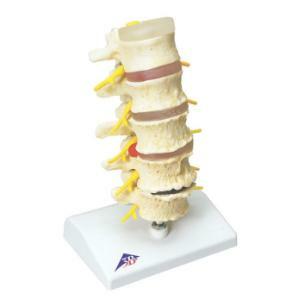 The model can be disassembled into vertebrae and intervertebral discs. Supplied on base.